Pictured from left are firearms safety instructor Steven Short; Bill Ireland, Firearms Safety Instructor Paul Bjorklund; Conservation Officer Joe Kulhanek; Firearms Safety Instructor Nic Wolf of the Apple Valley Police Department, and Southeast Metro Regional Training Officer Chelsie Grundhauser (kneeling). 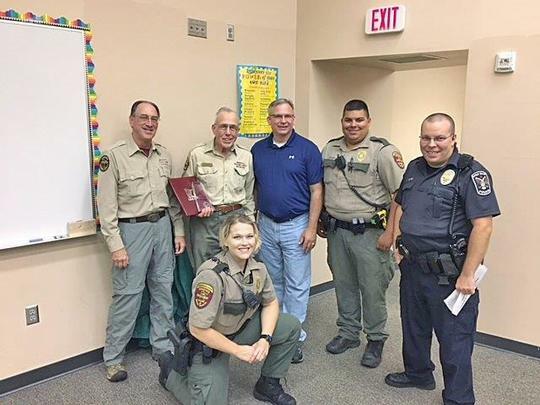 The Minnesota Department of Natural Resources Enforcement Division recently recognized a volunteer firearms safety instructor who has taught classes for 60 years. Carl Ireland (second from the left), of Apple Valley, began his firearms safety instructor career in 1958 after learning about a Boy Scout group in Richfield that wanted to provide its scouts the opportunity to be certified in firearms safety. He's been the lead instructor of the Apple Valley firearms safety class since 1976, has taught over 80 classes, certifying well over 5,000 students, and intends to continue on as long as he's able. L to R: CO Shane Vernier, Del Haverly, and Regional Training Officer Jen Mueller. 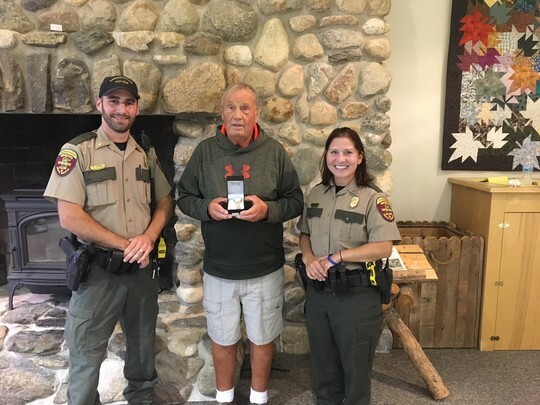 Recently, members of the Izaak Walton League gathered for their meeting at the Prairie Woods Environmental Center, and to see Del Haverly presented with his 50-year award for service as a volunteer Firearms Safety Instructor. Del became an instructor in 1968 when a neighbor told him he needed to be a FAS instructor that day. Del recalled never feeling so unprepared for anything but it was the beginning of a volunteer career that spanned many decades and touched the lives of many students from all kinds of backgrounds. "Del continues to have a passion for teaching hunter education and firearm safety", said DNR Regional Training Officer Jen Mueller. "Del said, "it never felt like a job, but more of a privilege.'" Del also reflected he had thoughts of quitting over the years, but stayed every time after walking into the classroom and seeing the faces of young students eager and ready to learn. He also added if he helped one student be safe, it was worth it. Del thanked his fellow instructors that he said were always ready to help when he asked. The RTOs and safety training staff have made significant progress on the new hunter education/firearms safety student manual since our last newsletter update this fall. We are continuing to complete and fine-tune chapter content and layout. We plan to have an electronic version of the draft manual for your review by December. A letter will be sent to you in early December, inviting you to review the manual with a link to the electronic draft. We encourage your feedback and ideas regarding the draft manual either via email, mail or in-person at the forums. This year's forums will take place in January and will be centered around the new manual. Please take a look at it and help us make it a great product that will assist you as you educate and guide the next generation of safe, responsible hunters. An instructor clinic to become a DNR Volunteer Trail Ambassador is scheduled for Saturday, December 1, 2018 at 10 AM. It will be held at the Carlos Avery Wildlife Management Area, 5463 W. Broadway Avenue, Forest Lake, MN. Please contact Bruce Lawrence, Recreational Vehicle Coordinator, at 763-267-8534 or by email at bruce.lawrence@state.mn.us for more information or to register for a spot in the class. As part of the International Snowmobile Manufacturers Association (ISMA) Safe Riders! You Make Snowmobiling Safe safety campaign, ISMA has just rolled out a new Safe Riders! video chapter series featuring 13 separate video chapters on snowmobiling lifestyle and safety-related guidelines and practices. The chapters are each 1 – 3 minutes in length, with segments regarding snowmobile operation, hand signals, snowmobiling on trails and respecting private property, snowmobile preparedness and snowmobile ethics, to name a few. If you would like a flash drive of the video chapters to use in your classroom or review portion before the riding performance activities, please contact us at enforcement.education@state.mn.us and we will mail it out. **NOTE: The videos will play best from your computer, so copy it to your computer from the flash drive before playing it. ISMA is also distributing Safe Riders! Information to clubs, associations and safety trainers. If your club or association would like to obtain the free collateral materials, which includes brochures, decals and posters, please contact the ISMA office at ISMASue@aol.com and request an order form. Fill it out and fax, email or snail mail it back to them. 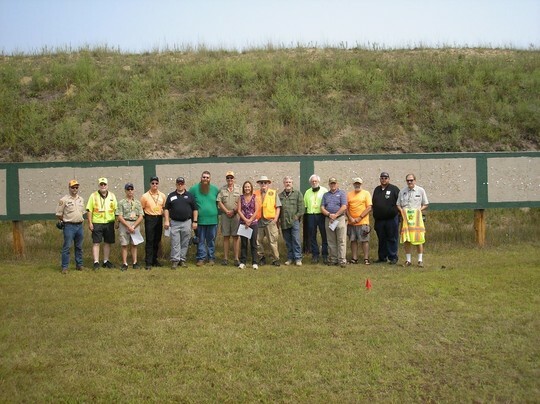 On August 18, 2018, a 9-hour NRA range safety officer (RSO) course was offered to DNR firearms safety instructors and held at Elk River Sportsman’s Club (ERSC), Elk River, MN. Twelve instructors completed the course and earned their NRA RSO credentials. This course is intended to enhance individual firearms safety programs by giving volunteer instructors hands-on training on what the responsibilities are for individuals designated to serve as RSOs during live-fire FAS range events. This course was sponsored by Minnesota Volunteer Safety Instructors Association (MVSIA) in cooperation with ERSC. If interested in hosting an NRA RSO course at your facility, send an e-mail to MVSIA at: registration@mvsia.org. Outdoor Edge Cutlery Corporation offers hunter education Instructors discounted items. Click here for the catalog: https://www.outdooredge.com/. If you would like the Pro-Form order form sent to you, send an email to enforcement.education@state.mn.us and we will send one to you. Third Hand Archery - Tree Stand Gun Hoist and other training aids available for purchase. Education materials can be purchased at Federal Premium Education Materials. IHEA - Subscribe to the International Hunter Education Association Email Newsletter.